Safe & Reliable Places to Stay in Washington, D.C.
By in large Washington, D.C. is safe city. It has more types of police roving around than most other U.S. cities. It will be challenging to find too many areas in downtown, or elsewhere that make the average tourist feel uncomfortable. The challenge for travelers usually isn’t finding a safe place to stay but an affordable one. Many travelers get priced out of downtown and often look to the surrounding cities and suburbs for safe and reliable places to stay in the greater Washington, D.C. area. Ask just about anyone who has lived in DC and they will tell you the Metro will make your life easier when visiting. Considering, it’s popular to seek hotels close to the DC metro in safe neighborhoods. Areas to Avoid in Washington, D.C.
Washington, D.C. has a few areas that some travelers will continually criticize.. These neighborhoods and corresponding Metro stations are Union Station, the NoMa station, and neighborhoods near the Nationals Ballpark. As you start to drift east and north after the Mt. Vernon metro station the neighborhoods show signs of hard times. As far as finding a safe hotel in Washington, DC the most popular areas / Metro stations will be Foggy-Bottom, Dupont Circle, Gallery Place, and Metro Center. 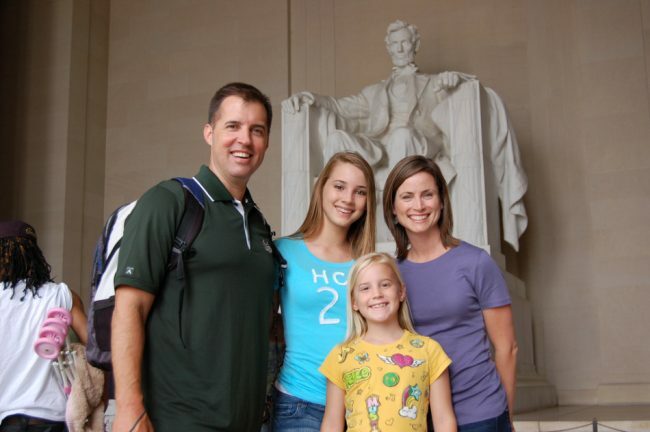 Best Safe Places to Stay in Washington, D.C..
Family Friendly Places to Stay in D.C. Without question the best hotel for families who want a safe hotel near Smithsonian museums and the National Mall is the Capitol Holiday Inn. The hotel has gone through renovations in 2014 and much is new. There is a beautiful courtyard and rooftop pool so kids can swim as well as run around close to the hotel. The location is not busy at night, so this will help parents keep an eye on their children. The only drawback is a lack of restaurants around the hotel, but most families may not mind that nuisance. Read our full article about where to stay in Washington, DC with a family. Cheap & Safe Places to Stay in D.C.
Finding a cheap and safe place to stay in Washington, D.C. can be tricky. It will be difficult to find a hotel under $200 per night during the week in D.C. However, on weekends hotel prices fall between $50 and $75. Hotels in the D.C. neighborhood of Foggy-Bottom are the best place to find a mix of a safe and cheap place to stay in D.C. A good back up plan might be the Days Inn near the Van Ness Metro station. Travelers who want to find affordable hotels during the week under $150 need to venture out into the suburban areas. Stay in Maryland Near Washington, D.C.
Finding a safe place to stay in Maryland near a Metro station outside of Washington, DC is great a way to save and feel comfortable in your surroundings. The best neighborhoods are Shady Grove, New Carrollton, or Branch Ave. All of these Metro stations have hotels nearby that offer free parking. Another options is Bethesda. However, don’t anticipate saving a whole lot over downtown DC hotels in Bethesda. Bike riders might appreciate that Bethesda is connected to downtown by the Capital Crescent trail. Silver Spring is a runner up to Bethesda. Stay in Virginia Near Washington, D.C.
Virginia offers many safe places to stay with near the Metro. Probably the best mix of affordability and comfortable surroundings is Dunn Loring, East Falls Church, Eisenhower, or Spring Hil. All of these areas are well liked by tourist and have hotels with free parking. Ballston and Clarendon in Arlington, VA will offer the best blend of vibrant urban hubs, but on average cost more. The Comfort Inn at Ballston is a popular choice. The Courtyard near the Dunn Lorning Metro is one of the most popular hotel choices on this website and is directly of I-66, right across from the Metro and 30 minutes outside DC. Is Arlington, VA a Safe Place to Stay? Is Bethesda a Safe Places to Stay? Bethesda Neighborhood: With welcoming main streets and amazing restaurant selection Bethesda provides a comforting urban pocket surrounded by affluent single family homes. Bethesda will appeal to both families and couples, but may not appeal to younger couples. Mature couples who want to experience good restaurants after a day of sightseeing will love this location. Families will feel at home surrounded by other D.C. families taking and evenings stroll to get ice cream. You can ride your bike to D.C. long a paved trail in about 45 minutes. Bethesda is also a shopping mecca. Its streets are lined with specialty shops and high-end boutiques.